Fiction – paperback; Portobello Books; 280 pages; 2014. Translated from the German by Susan Bernofsky. Every November bloggers Caroline and Lizzy host German Literature Month, which is a good excuse to dig out those German language books languishing in my TBR. 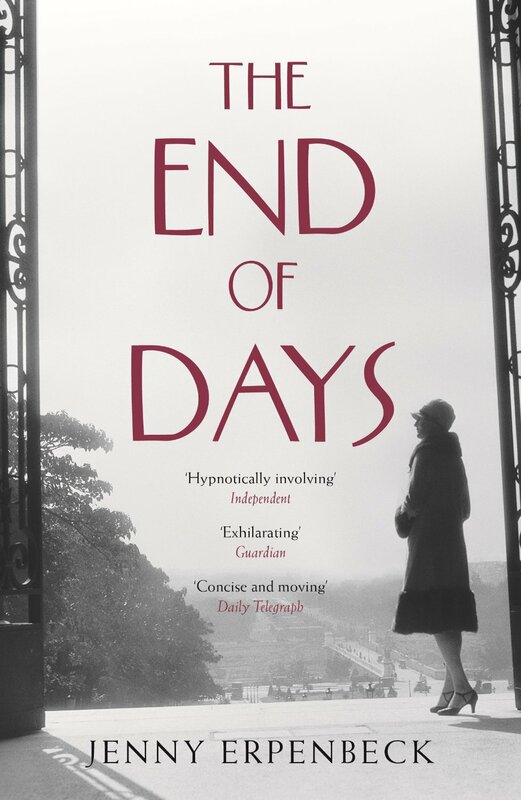 This year, however, I decided to treat myself to a new novel, which is how I came to buy Jenny Erpenbeck’s award-winning and critically acclaimed The End of Days at Waterstone’s late last month. The novel, which is broken up into five parts, tells the story of one woman’s life from cradle to grave. But it does not follow the normal narrative conventions, for at the end of each part cruel fate steps in and the protagonist dies. But then the author plays with the idea of “what if?” and the next section of the book explores what might have happened if the (unnamed) woman had continued to live. All this is played out against the backdrop of Europe’s turbulent 20th century history, including anti-Semitism, the rise of the Third Reich, and Communism. It’s a neat way to explore how chance and choice and the little decisions we make every day can have a big impact on our lives, and begs the question, is that what happens with world history, too? Admittedly, reading this book was an uneven experience for me. The first two parts were some of the most compelling — and moving — literary fiction I’ve ever read. Who could not be intrigued by the idea of a baby dying in her cradle, aged just eight months, and then seeing the outfall on her parents — a Gentile father, who flees to America to escape the pain of his loss, and a Jewish mother, who falls apart emotionally and accidentally falls into prostitution to support herself? The second part, which explores what would happen if the baby had survived (because the parents had rubbed a handful of snow on her chest to bring her back from the brink of death), follows the now 17-year-old girl being uprooted from her home in Eastern Europe and settling in Vienna, where it is hoped she will lead a better life. But it’s 1919 and food, fuel wood — and hope — is in short supply. There is increasing, yet unspoken, pressure on her to sell herself in order to sustain her family, but instead she enters into a suicide pact with a fellow student. The third part charts a new variation of the young woman’s life had that pact failed, but this is where my interest in the novel began to wane. I’m not sure if that’s because I’d got used to the “trick” of the story, or whether it was because the prose style suddenly became dry and detached, a mirror perhaps of the period of Communist history in which it was set. I won’t elaborate on the final two parts of the story, but I found the narrative recaptured my attention once again, and I was left feeling slightly shattered by the time I’d reached the final page. The End of Days is a relatively short novel, but it’s a powerful, passionate and philosophical one. The prose is rich and evocative, and the story so filled with ideas, concepts and political, socio-economic and cultural themes that it would take an age to unpack them all. But, in my opinion, the narrative power, so strong in the first 115 pages, isn’t sustained, weakening the overall effect. Not that my opinion really matters: this book was described as a “work of genius” when it won the 2015 Independent Foreign Fiction prize earlier this year. For other takes on this novel, please do read the review on Lizzy’s Literary Life and the one on JacquiWine’s Journal. Very thoughtful review, Kim. I think what you say chimes in with the reactions of several other bloggers I’ve read. Although the idea sounds very clever, it’s a shame the quality of the narrative couldn’t be sustained all the way through. Thanks… Initially I was “wowed” by this novel, so to get half way and then find the momentum had gone was a bit of a shock. But it’s still a rather wonderful novel and I can see why it won the IFFP. I’m keen to try her earlier novels now. I really struggled with the same section, and considered giving up, but slogged on as it was our book group choice. We found that her refusal to name most of the characters kept them aloof from us, but some of the prose and the translation was excellent. Ah, so it wasn’t just me (and Jacqui) then… And I agree; the lack of names makes it feel like you are one removed, that you are reading about strangers and not friends. Well … It was the third section that sealed the deal for me and 12 months later, it’s only that section that I can remember. Just goes to show. It’s interesting that that part stuck with you… I wonder if I’ll need to reassess my opinion a year down the line? It’s a little while since I read this but I remember the Russian section became bogeed down in esoteric political detail. In my review I described it as a Marmite book – I like Marmite! I’d recommend Visitation which explores East/West Germany then reunification through a house and it’s sucessive owners. I like the sound of Visitation and have added it to my wish list. Great review, Kim, and many thanks for the link. As you say, this novel is full of ideas on both a macro and a micro scale. I agree about the lack of names, too – it does put a certain level of distance between the reader and these characters. The name thing is funny, isn’t it? I’ve read plenty of novels filled with unnamed characters and not had problems identifying with them or caring about them, but in this one it creates a level of emotional detachment that works against it. I’ve only become aware of this author recently and several of her books look appealing including this one. Wasn’t another recent book, ‘Life after Life’, along a similar theme? I haven’t read that one either. Yes, you’re likely thinking of Kate Atkinson’s Life After Life, which I haven’t read. Lizzie’s review (which I’ve linked to) draws comparisons between both of them as they were written at about the same time and cover the same period in history, though one comes from a German/European perspective and the other from an English perspective. BTW I like the cover but it’s a shame they couldn’t have tweaked the picture so that the gates ran parallel down both edges of the cover. Yes, and that would be so easy to do, too. It sounds like a great premise. Shame it wasn’t sustained for you. It’s a great read, Cathy, just one section that lost a bit of momentum, but it soon picks up again. Definitely worth a read. I think this is probably one of my favourite books I have read this year, if not ever! Such a clever and well written peice of fiction. Glad to hear you enjoyed it, Alice. Did you review it on your blog? If so, please do leave a link in a comment. High praise coming from you, even though only for the first part. I’m really tempted. I suspect you’ll probably love it, Caroline. I was impressed by the writing … It’s quite an emotional read and very affecting.